Bringing together a brand experience is an orchestration of event marketing, retail design, staff training, and theater showmanship. Having an experienced experiential partner helps brands avoid the inevitable bumps in the road, keeping efforts on track. Often one of these bumps is figuring out how to staff each event. Brands staff their own employees, from retail, operations, or the corporate office. Staffers are scheduled to work in shifts, interacting with the public, handling the media and event organizers. Pros: Employees can be passionate and loyal brand advocates. They can speak from first-hand experience, and highlight how the brand supports individuals in the community. Many times they are salaried or even volunteers, so it does not cost the company extra budget. Cons: Employees may be fantastic at their individual jobs, but few are also outstanding at interacting with event attendees or conducting media interviews in an approachable and knowledgeable, but non-invasive way. They may not receive special training before the event, which inadvertently can create disorganized or unprofessional brand impressions. Teams of PR Spokespeople, Product Specialists and Brand Ambassadors are sourced and hired by a 3rd party. They are trained on the brand, the products, key message points, and the duties to be accomplished on site. They are outfitted in branded gear and provide reports, photos, and videos to recap activity that occurred on site. Pros: Professionals that work events daily excel at making interpersonal connections. They are outgoing, likeable, authoritative, and can strike up conversations with anyone, anywhere. They deliver the brands’ key messaging points reliably. They anticipate issues, errors and common mistakes with event setups, and can head off problems before they occur. Cons: They may not be loyal, passionate devotees of the brand or product. There are also additional investments required of the brand, from planning, training and attire, to travel and equipment. Often, the best team to represent a brand in an experiential setting is a hybrid, using experts from the brand and event pros to perform in concert. It requires a little more planning and coordination, but the effect is a better brand experience and stronger results. 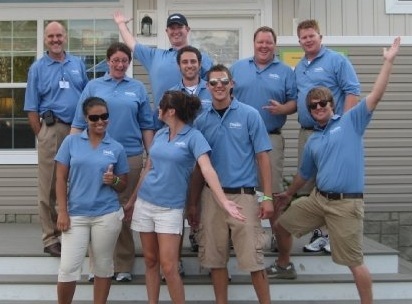 This ideal team is a mix of brand employees, partners and hired event professionals. Each works within their specific role to create a seamless environment for the audience to experience the best the brand has to offer. Hired event pros manage event production, operations, staff schedules, routing, permits, and logistics. Brand Ambassadors and Product Specialists are the first line of contact that event attendees meet. They are the street team, the product samplers, the product demonstrators, the soft sellers and inviting faces that attract people into the brand experience. The Brand brings the most enthusiastic and loyal employees, and the best representatives from PR and Marketing to play the roles of On-Air Spokesperson and Brand Manager. Sales personnel close potential sales brought to them by the event pros. Together, the brand and trusted experiential partners build multi-faceted training programs, schedules for all involved, clear roles and responsibilities, and a course for a successful program. 2013 - The Year of Experiential?